A raging fire has engulfed the roof of Paris' iconic Notre Dame Cathedral and toppled its spire as thousands of people watch on in horror from the streets below. 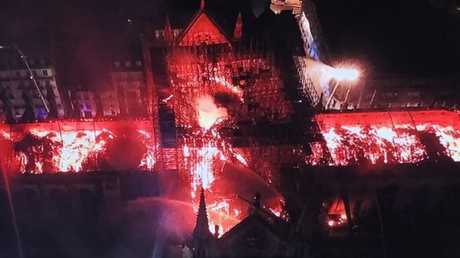 Notre Dame spokesman Andre Finot told French media that "everything is burning, nothing will remain from the frame" of the beloved 850-year-old structure. The Cathedral is one of France's most popular tourist attractions and draws about 13 million tourists each year. A spokesman said the entire wooden frame of the cathedral would likely come down, and that the vault of the edifice could be threatened, as thick plumes of smoke continue to billow into the sky. The stonework and stained glass of the edifice recreate images and lessons from the Bible. The fire spread to one of the church's landmark rectangular towers, with reports that flames could at one stage be seen behind an oblong stained-glass window in the tower. Paris Fire Department commander general Jean-Claude Gallet said the cathedral's main structure has been saved after hours of work by firefighters on the scene. "We can consider that the main structure of Notre-Dame has been saved and preserved", Mr Gallet told reporters outside the cathedral. 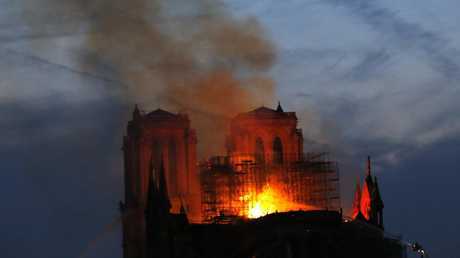 He said it appeared that the two main towers of the building had also been saved but that it couldn't be confirmed until the temperature inside the cathedral has cooled, which is expected to take several hours. Deputy Interior Minister Laurent Nunez said that for the first time "the fire had decreased in intensity" while still urging "extreme caution". Earlier on Monday, Mr Gallet said the next hour-and-a-half was "crucial" in order to see if the fire could be contained. "There's a risk that the great bells fall. If the bells fall, it's the tower that collapses," Mr Gallet told reporters. "There are firefighters inside and outside. "We need to win this battle and block the spreading of the flames. The most efficient action is from the inside. We are not sure if we will be able to stop the spreading of the flames to the North Tower." The fire in Notre Dame. As the flames tore through the cathedral, dozens of Parisians gathered outside the exclusion zone to sing hymns as the building was ravaged by the flames. Many of them were crying, according to local media. Australian Divya Bala, who has lived in Paris for two years, told news.com.au that it was "shocking" to witness the iconic building be destroyed. She was walking home when friends and colleagues alerted her to the unfolding tragedy about 7pm Monday. "By the time I got down to a vantage point, the spire almost looked like a skeleton of fire. It was devastating," said Miss Bala, a writer who hails from Sydney. "I've only lived in Paris for two years but to see a monument like that just up in an inferno of flames was breathtaking in the worst way." The bridges and riverbanks surrounding the cathedral were crowded with Parisians six or seven people deep, according to Ms Bala. "Everyone just stayed out watching, very calmly, very quietly," she said. "Some people were in tears, one older gentleman was holding himself up by the railing on the bridge and people were comforting him. "But I was really struck by how calm everyone was." Miss Bala watched along with the crowds for a few hours before returning home. "As I was walking back, it was the sight of the crowds that really struck me. Motionless, all starting at Notre Dame in silence. Thousands of people," she said. "It was bigger than a church, as it were." The cause of the catastrophic blaze was not known, but French media quoted the Paris fire brigade as saying the fire is "potentially linked" to a six million- euro (A$9.4 million) renovation project on the church's spire and its 250 tons of lead. The cathedral was undergoing renovations after cracks started to appear in the stone, sparking fears the structure could become unstable. It came after the Catholic Church in France appealed for funds to save the building. France 2 television reported police were treating the incident as an accident. Prosecutors opened an investigation as Paris police said there were no reported deaths. Earlier on Monday, Mr Macron postponed a televised speech to the nation because of the stunning blaze and was going to the cathedral himself. "Like all our compatriots, I am sad this evening to see this part of all of us burn," he tweeted. Built in the 12th and 13th centuries, Notre Dame is the most famous of the Gothic cathedrals of the Middle Ages as well as one of the most beloved structures in the world. Situated on the Ile de la Cite, an island in the Seine, the cathedral's architecture is famous for, among other things, its many gargoyles and its iconic flying buttresses. It's considered an architectural feat and a religious and cultural symbol of France. The cathedral was immortalised in Victor Hugo's "The Hunchback of Notre Dame," published in 1831, and has long been a subject of fascination in popular culture as well as the traditional art world. The first stone of the Notre Dame was laid by Pope Alexander III in 1163 during the reign of Louis VII, as the medieval city of Paris was growing in population and importance, both as a political and economic centre of the kingdom of France. Construction continued for much of the next century, with major restoration and additions made in the 17th and 18th centuries. French historian Camille Pascal told BFM broadcast channel the blaze marked "the destruction of invaluable heritage." "It's been 800 years that the Cathedral watches over Paris", Mr Pascal said. "Happy and unfortunate events for centuries have been marked by the bells of Notre Dame." He added: "We can be only horrified by what we see." Associated Press reporters at the scene saw massive plumes of yellow brown smoke filling the air above the Cathedral and ash falling on the island that houses Notre Dame and marks the centre of Paris. As the spire fell, the sky lit up orange. Paris Mayor Anne Hidalgo is in despair at the "terrible fire." 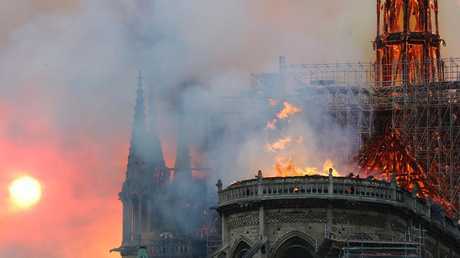 Ms Hidalgo said in a Twitter post that Paris firefighters were still trying to limit the fire and urged Paris citizens to respect the security perimeter that has been set around the cathedral. Ms Hidalgo said Paris authorities are in touch with Paris diocese. Reactions from around the world came swiftly. The Vatican this morning released a statement. "The Holy See has learned with shock and sadness the news of the terrible fire that has devastated the Cathedral of Notre Dame de Paris, symbol of Christianity, in France and in the world," it read. "We express our closeness to the French Catholic and to the people of Paris. We pray for the fire fighters and for all those who are doing everything possible to face this dramatic situation." UN Secretary-General António Guterres said he was "horrified" by the images coming out of Paris. "Horrified by the pictures coming from Paris with the fire engulfing Notre Dame Cathedral - a unique example of world heritage that has stood tall since the 14th century," Mr Guterres wrote in a tweet. "My thoughts are with the people and government of France." In Washington, US President Donald Trump tweeted: "So horrible to watch the massive fire at Notre Dame Cathedral in Paris" and suggested first responders use "flying water tankers" to put it out. "Must act quickly!" he wrote. In response to Mr Trump's tweet, France's deputy interior minister defended not using waterbombing planes, saying that it would have posed a "major danger" to the structure. 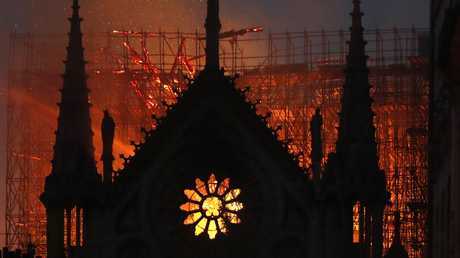 Cardinal Timothy Dolan, the archbishop of New York, said he was praying "to ask the intercession of Notre Dame, our Lady, for the Cathedral at the heart of Paris, and of civilisation, now in flames! God preserve this splendid house of prayer, and protect those battling the blaze."